One Set of Unpainted 3/4 Preemie Vinyl Arms and Legs. Posable Cuddler Body & Unpainted Vinyl 1/4 Limb Set. for 18" Doll Heads by Adrie. Unpainted Vinyl #114 Limb Set. #115 Unpainted Vinyl Limb Set. Unpainted Vinyl #116 Limb Set. #117 Unpainted Vinyl 3/4 Limb Set. Unpainted Vinyl #121 Full Limb Set. Unpainted Vinyl #119 Full Limb Set. Unpainted Vinyl #120 Full Limb Set. 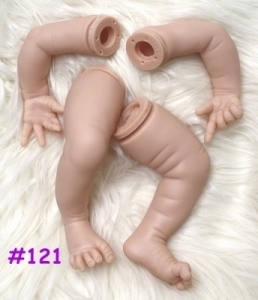 One Set of Unpainted Vinyl 3/4 Infant Limbs. 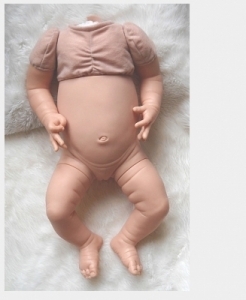 Create a 19" Infant Doll. One Unpainted Set of 3/4 Infant Limbs. With new baby wrinkles and creases. 1 Set of Unpainted 3/4 Vinyl Arms and Legs. Unpainted Vinyl 3/4 arms & 7/8 legs - Limb Set. Limb Set Produced by Adrie. 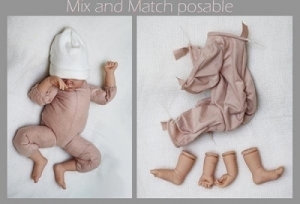 Newborn Style, 1 Set of Unpainted 3/4 Vinyl Arms and Legs. Set of Tiny 3/4 Micro Tiny Unpainted Vinyl Arms & Legs. Great if you want to sculpt a doll head for a 6" baby.